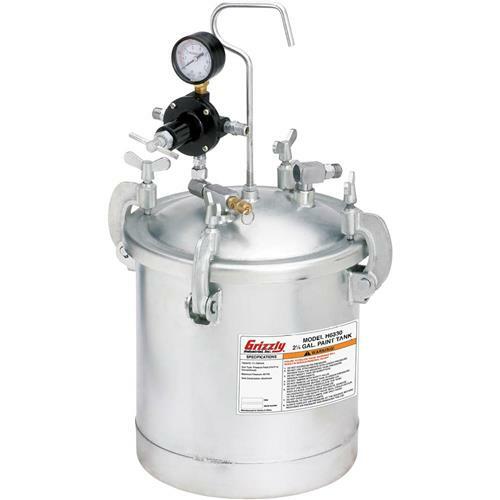 With a 2-1/4 gallon capacity, this Paint Tank features a smooth-walled galvanized-steel tank for easy cleanup, double output regulator and pressure relief/safety valve. Lid gasket and clamps stay attached during lid removal. Works with any pressure feed HVLP or conventional spray gun. 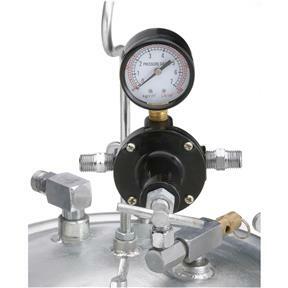 Maximum pressure is 45 PSI. Hose not included. I bought this pressure pot for resin casting, and with the necessary mods Im satisfied with it. No issues. Product is great. Unit converted to a pressure tank for resin casting. Delivery by FedEx leaves a lot to be desired. Unit was literally dropped (from a height of 2.75 feet) on my doorstep. Container was ripped open indicating abuse during shipping but the unit was undamaged.